indicators for monitoring and how landscape function can be tracked and analyzed as part of a comprehensive monitoring program. 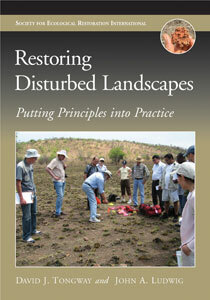 "This is an excellent guide on how to restore degraded landscapes. Tongway and Ludwig have brought together their insights from three decades of research on landscape function. They are uniquely qualified to provide this readable account of the determinants of functional versus dysfunctional landscapes, and their five-step procedure for how to restore the latter has an impressive record." "Many countries, including Australia, suffer the loss of billions of dollars from land degradation every year from problems of the kind Tongway and Ludwig address in Restoring Disturbed Landscapes. This wonderful book will trigger a revolution in land-use strategies and should be in the hands and minds of everyone, from graziers to academics, who wants a secure future for our world." "Restoring landscape function, so vital to ecosystem services, is the next frontier for restorationists, and Tongway and Ludwig describe that future eloquently. Their in-depth treatment of function and case studies are especially helpful, and the photos clearly demonstrate that the authors walk their talk. As a restoration practitioner and researcher, I find that this book has filled a critical gap for me. It should be a part of every restorationist's arsenal." "Experts in the field of landscape restoration, the authors share their extensive knowledge and experiences for the purpose of encouraging ecosystem rehabilitation. They present a report on their concepts and tested methods that can be used in sites around the world in order to 'repair damaged landscape to an acceptable level of functionality.' The five-step procedure will serve as a useful guide to professionals and those interested in restoration practices in a broad range of problems." "...the authors succeeded in their objective. That is, to make the reader think more about function or process and less about the simple presence or abundance of species and life forms as measures of restoration success."